Is there softness in the Cave Creek market? Last month’s highest-priced home sale in Cave Creek of $985,000 was the first month in almost two years that the highest price home was less than $1,000,000. The highest-priced home was $695,000 in Feb ‘17, but every month since then has been over a million dollars, including 7 months over $1.5 million. Was this just an inevitable statistical anomaly, or are we seeing the first signs of softness in the market? It’s too early to tell, but we’ll keep our eyes on it in the coming months. The Axis on the left shows how many homes have sold for $1,000,000 or more so far, year to date (through May.) 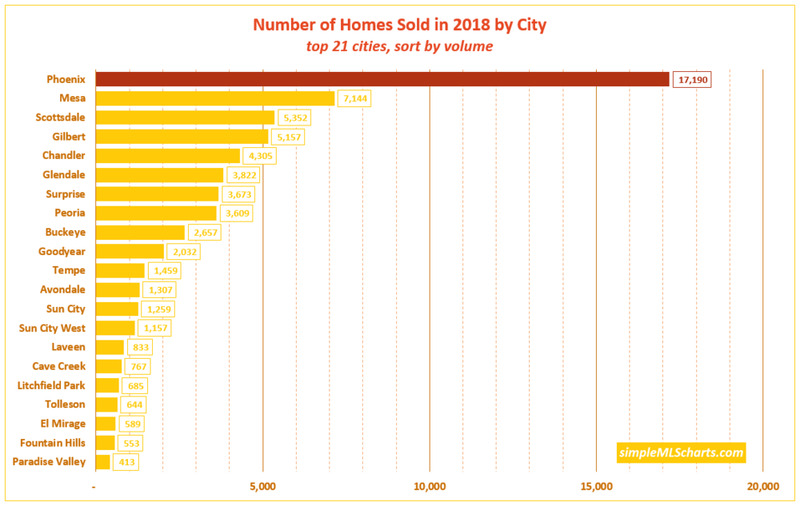 So, the higher the bubble is on the chart, the more luxury homes have sold in that city. Scottsdale leads the way, with 381 homes selling for more than $1 million so far this year. Paradise Valley had 164, and Phoenix (at 112) was the only other city with more than 100 sales above $1 million. The Size of the bubble shows the luxury sales as a percentage of that city's overall market. While Scottsdale had more million dollar sales overall, Paradise Valley's market is made up almost entirely of luxury homes, with 84% of all sales being greater than $1,000,000. Scottdale's luxury market, in contrast, only makes up about 16% of the total market. Carefree (22%) and Fountain Hills (10%) are the only other cities with a significant luxury market. Most Expensive Home is in Scottsdale, again. Scottsdale dwarfs all other cities, with a Maximum Sold Price of $17.50 million. Paradise Valley was next ($5.95 million), followed by Phoenix ($4.1 million), Gilbert ($3.5 million), and Chandler ($2.69 million). No other city had a single sale above $2 million.